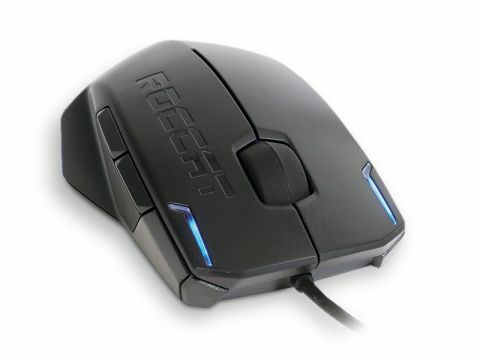 Roccat release another gaming mouse, but can it compete against the legendary G9? Roccat have just released a new lightweight gaming mouse called the Kova. Roccat, for those of you who have never heard of them, is fast becoming the new Razor, and I'm sure that's by design. Razor has its 'Cult of Razor', whereby each person who buys its kit is invited to wear black robes with funny green squiggles and attend ritualistic, clandestine meetings (probably); now Roccat gives you ID cards with each purchase so you can flash it like a Blue Peter badge. But it's not this I am alluding to. Oh no, Roccat is fast becoming the new Razor because, with each product release, it's winding me up more and more. The Valo keyboard really started it off, being as it was a peripheral specifically designed for the PC gamer while also specifically useless on said machine. My main gripe is that as a PC owner you will have to use pre-OS menus and the Valo refused to function, USB Legacy mode on or not. Aside from the fact that the Kova mouse is as comfortable to grip as Pinhead the Cenobite's face, and feels like it might blow off the desk if you left the window open, it's also a bit of an awkward bugger to get going. Its 'big thing' is its driverless design, operating as it does completely off its own hardware. This would be great were it compatible (as it says it is on the website) with Windows 7. We tried it on various machines and the best we could manage was 15 seconds of operation before it shut down. On XP it was fine though, enabling us to change lighting, DPI settings and, er, more lighting, with a few button combinations. Unfortunately, there's no display to show what DPI setting you're on, so it's a question of flicking through to find the one you think you want. So, I'm going to state the simple fact that the Logitech G9 is still available for considerably less than this lightweight gaming rodent.